President Park Geun-hye on Sunday urged Japan to face up to and sincerely atone for its brutalities during colonial rule as a first step to writing a “new history” with Korea for the next 50 years. 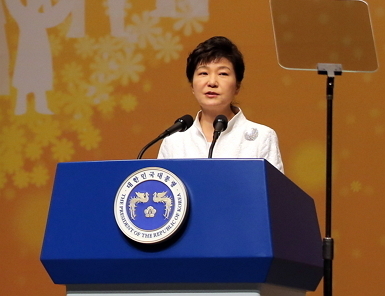 In her Independence Movement Day address, she called for the two Koreas to meet to discuss reunions of families displaced by the 1950-53 Korean War, while expanding cooperation in sports, culture, arts and humanitarian areas. “Nationalist feelings can still be exploited, and it’s not hard for a political leader anywhere to earn cheap applause by vilifying a former enemy,” she said. A senior official at Seoul’s Foreign Ministry downplayed her assessment as nothing new, saying it will be an “overinterpretation” to conclude that it was to back Japan’s claims while taking a swipe at South Korea and China. As to Pyongyang, Park apparently sought to convey relatively conciliatory messages and focus more on humanitarian and civilian exchanges than military issues. This reflects South Korea’s pursuit to bring the communist regime to the negotiating table, now that it has set better cross-border ties and unification preparation as the centerpiece of Park’s third-year presidency. “Our efforts to prepare for unification is ever aimed at isolating North Korea but to help lead it to come out as a responsible member of the international community and take the course of mutual prosperity and peace,” she said. The family reunions remain a top priority given the rapid aging of the survivors, she said, reiterating calls for talks “as soon as possible” to arrange regular meetings and exchange of letters and the identification of the families. To help restore the divided state’s national homogeneity, Park pledged to support various joint cultural and economic projects such as for historical study and a trans-peninsula railway. “North Korea should forgo the illusion that nuclear weapons will provide protection, and come out and take the path to opening up and change that can improve the livelihoods of the people and earnestly guarantee peace and regime stability,” the president added. Early this year, Seoul proposed inter-Korean meetings to discuss “all issues of mutual interest” including a possible lifting of bilateral sanctions and restart of lucrative tours to a mountain resort in the North. The North Korean leader also boosted hopes for a thaw by expressing, in his New Year address, his willingness for “highest-level” talks with the South. Yet the mood quickly cooled as the sides failed to build on the momentum and instead continued spats such as over launches of anti-Pyongyang leaflets by civic groups here. With South Korea and the U.S. scheduled for annual military drills until late April, tension on the peninsula will likely escalate as the Kim regime engages in a show of force in retaliation, firing short-range missiles, breaching the de-facto maritime border or staging other small-scale provocations, experts say.